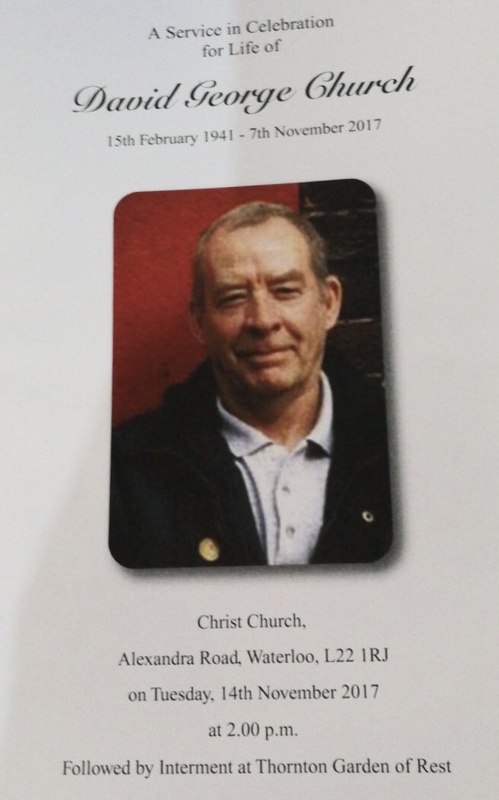 Some may have noted the sad passing this week of Dave Church, one of the principal founders of the Hillsborough Justice Campaign. Dave was a staunch defender of all affected by the disaster. Indeed, upon hearing of Goldring's introduction of Q7 at the Inquests, he is quoted as having said, "I fought for our Gary for 25 years. Now I'll fight for his mates." A true gent and a proper supporter, we salute him. In the article, the Church family has issued an "all welcome" invitation to Dave's funeral. David Church: He Climbed The Hill In His Own Way. 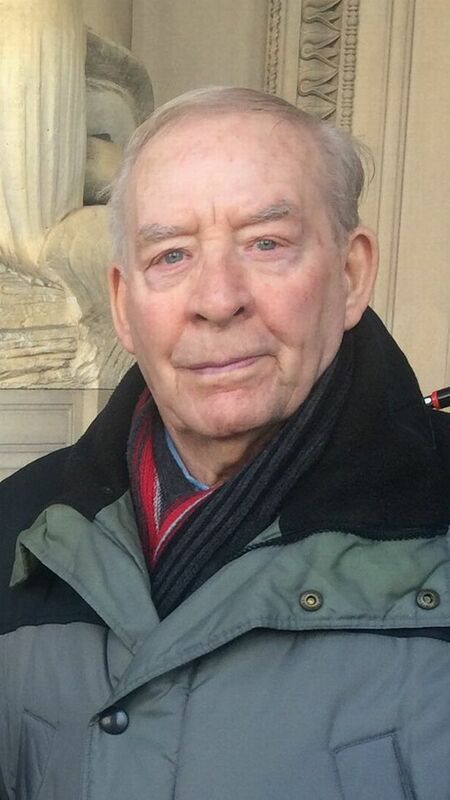 "A true gent and a proper supporter, we salute him." Support the team,Trust & Believe. Rest in peace now, Thanks for fighting the good fight. Your son is proud of you. RIP after a life well lived and a fight well fought. YNWA. Infamy,infamy,they've all got it in for me. Condolences to family and his friends. 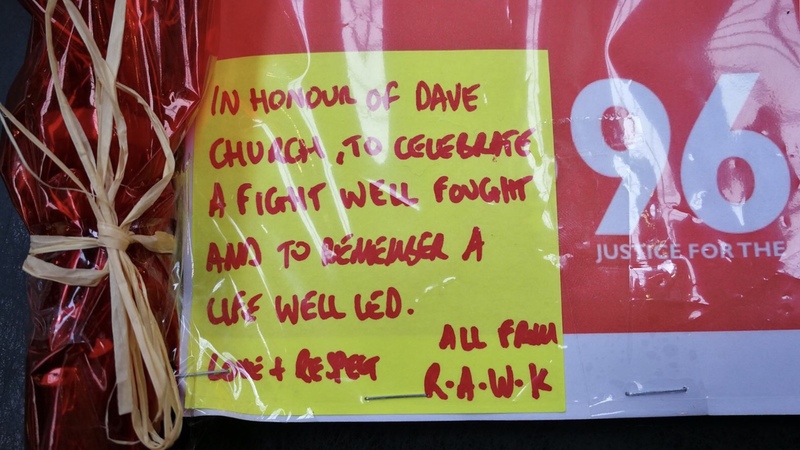 RIP Dave - agree with comment above a "fight well fought"
I have total respect for Dave. Imagine the heartbreak of losing a son at that age, that would bring devastation and heartbreak unimaginable then the courage to fight a battle for the rest of your life. a battle you never wanted, you never asked for and to fight that battle so well. The times the families were at dead-ends smashed by an establishment trying to hide its mistakes and still the courage and tenacity not to let it go despite the pain, the anguish that destroys you from inside. Dave did Gary proud and is more of a hero than any sportstar or celebrity, to carry on despite everything takes real courage and shows the type of heroism that is rarely acknowledged. His fight is over RIP Dave. He's with his son now. Dave did Gary proud and is more of a hero than any sportstar or celebrity, to carry on despite everything takes real courage and shows the type of heroism that is rarely acknowledged. His fight is over RIP Dave. I've booked my train tickets now and will go to the funeral with a floral tribute from RAWK. If anyone else from here is planning to attend, drop me a PM if you like. RIP Dave - a fight well fought and a life well lived. Changed British legal history in the fight for Justice. Well, that was a lovely service and, as we have all come to learn and understand from the families of the Hillsborough victims, an exceptionally dignified occasion. Pete Carney, Shelia Coleman and Steve Kelly all gave very moving tributes in the church. Dave's daughter Karen cast our flowers into her father's grave with the words, "This is from Gary's mates, dad!" before wishing him a tearful goodnight. They had no price. None of the families or survivors have a price. All they've ever fought for is the truth to come out and for justice to be seen to be done. The former was Dave's battle - the latter is his legacy battle - and we'll keep fighting it for him and the rest until everyone remaining can rest. RIP Dave - a true Scouse warrior. Mr Alex Ferguson on Anfield after St Etienne 77 : "I didn't walk away from the ground after the game, I floated out. I had been caught up in the most exciting football atmosphere I have ever experienced...these Liverpool fans support with PASSION"
Say hello to your lad. I'm glad you'll be together again. Choked me reading that & shame on that solicitor too. i was once told 'why dont you go out and meet somebody' i said 'i dont want to meet somebody. I want to meet everybody'!! I mentioned that Peter Carney gave a wonderful tribute to Dave during the service. I asked him if he would mind me posting his words here for you all to read. He has kindly sent me the transcript and I am pleased to copy it below. It was a great mix of humour, sentiment, pathos and remembrance. Nigh swan, lid. Dave Church was a friend of mine. I came to meet Dave through his son, Gary. Me & Gary once went to the same football match, which to me makes me & Gary mates. The match only lasted six minutes. Gary left one way, I left another. To me. We went in as mates, we left as mates, we’re still mates and we always will be mates. To me. Being a mate of Gary made me a friend of his Dad, Dave. I was almost thirty years of age, when me and my mates went to that six minute match. In nearly thirty years since then, me and Dave have been back many times to that same six minute match. Being my friend, Dave gave. He gave me a smile when we met. Gave me a smile to show he was glad to see me, glad to give his time, glad to give his attention. Dave never asked for or expected anything back & he gave me more than I could ever give back. A smile, time, attention, knowledge, experience, advice, a laugh, veg off his allotment. Dave gave. Dave gave because giving was his goodness & his gift. And Dave shared. He shared because sharing was his pleasure. Dave gave for the goodness of giving and shared for the pleasure of sharing. Dave gave support when you struggled, gave assistance for your troubles. Despite his own troubles, Dave gave. For all the troubles we went through and shared together, Dave gave me support & strength to survive that six minute match. Dave wasn’t at the six minute match but he saw what happened, clearly. As it happened. Instinctively, clearly. Instantly, he had a vision of what happened at the six minute match. He consistently, constantly and continuously kept his clear vision. From day one to the end of his days. Through all the inquiries and deliberations, his instinct, his intelligence, his inquisitive nature, his indomitable spirit, carried his clear vision. To Dave, it was clear. And he told anyone who would listen. It was clearly a cover up. Clearly a cover up of killing. And nearly thirty years later, a jury agreed. Dave was determined, dedicated, diligent in dissecting details and dynamite in exploding the devious ways of duckers and divers who tried to divert him from what Dave could see had happened. They were creating a cover up for unlawful killing, but Dave could see what they were up to. They were blaming survivors and supporters but Dave could see what they were up to. Dave listened to, and got great comfort from, what Gary’s gang said about the six minute match. He listened and encouraged survivors to speak of our experience. For our own good, and for the good of the victims who were killed. “You’ll feel better saying it how it is, instead of hiding it away. If you get anything wrong let them try to prove it. But you haven’t done anything wrong so say it as it is”. Dave could see what survivors said happened, happened. Dave could see that Gary, the victims, the survivors and the supporters bore no blame for the blunders that caused the catastrophe. Nearly thirty years later, a jury agreed. The survivors and supporters did not contribute to the dangerous situation. For nearly thirty years, Dave refused to accept the official, or any official’s, version of events. Or their contrived verdicts. Or the deceitful diversions they devised to avoid the perpetrators facing their peers or their punishment. He challenged them all, and their accomplices, every chance he got and he double bluffed the legal lizards that littered the trail to the real truth or tried to lead him down blind alleys. Dave Church never suffered fools. Especially fools who tried to pull the wool over his eyes. Or wore a wool wig. Or sat on a woolsack. But he reserved a real rage for the ridiculous rantings of the rancid rag and the sheep that read it. 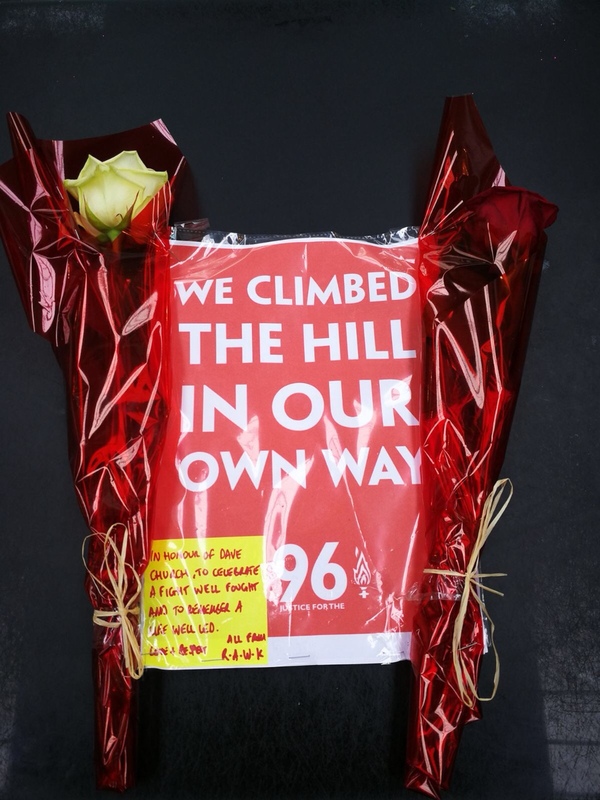 Dave and his wife, Maureen, were founder members of the Hillsborough Justice Campaign. 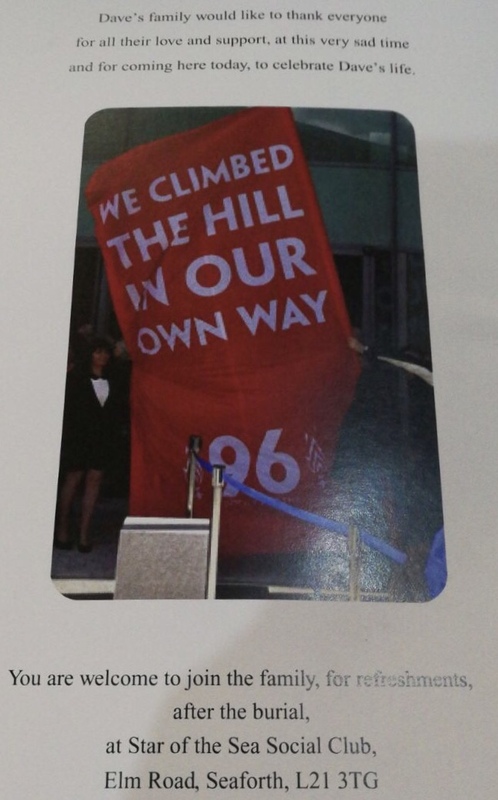 When the name was chosen, Dave took great pride in pointing out that he and Maureen were the first to be identified as the Hillsborough Justice Campaign, lobbying for support at the 1990 Labour Party conference in Blackpool. Personally, I will always be grateful to Dave, and his wife Maureen, for giving me support, reassurance, strength & inspiration. They were both a great help for myself, and many other survivors, trying to cope with the turmoil and troubles the six minute match served on us. The day that Dave died was a sad day, but contrary to the catastrophic calamity that caused our coming together, Dave will live on in my mind as a determined dad, a faithful friend, a dapper dresser, an avid allotment activist, and a man with a smile in reserve (unless his tomatoes failed). Dave will live on in my mind as a friend who gave & I’m grateful for all he gave me (except his green potatoes). If Dave should leave a legacy. Let it be a legacy that will linger and last. A legacy of the way Dave lived his life.